Life with Dylan: Do You Live an Earth-friendly Lifestyle? Recycling is the most common thing people do to help the environment. Many think that this is all they need to do and nothing else really matters. Well, have you ever thought about how you recycle your aluminum cans and plastic bottles? Most people grab a plastic bag and start filling it up. When the bag is full they head over to the recycling center and collect the money. Well, that plastic bag is usually just thrown away. Plastic bags do not go away. Plastic bags end up polluting the ocean, harming marine life, and filling up our landfills. Think outside the box when you recycle your cans and bottles. All those reusable shopping bags you have ... I know I have at least 15 in my trunk and about 10 in my home. These reusable bags make a great way to collect your recyclables until you make a trip to the recycling center. Especially if you live in an apartment. If you have a large yard, patio, or garage there are other options. Use a large container or trash can for you recyclables. Some of the best I have found are from the Container Store. These clear bins are easily washed and stack for smaller areas. 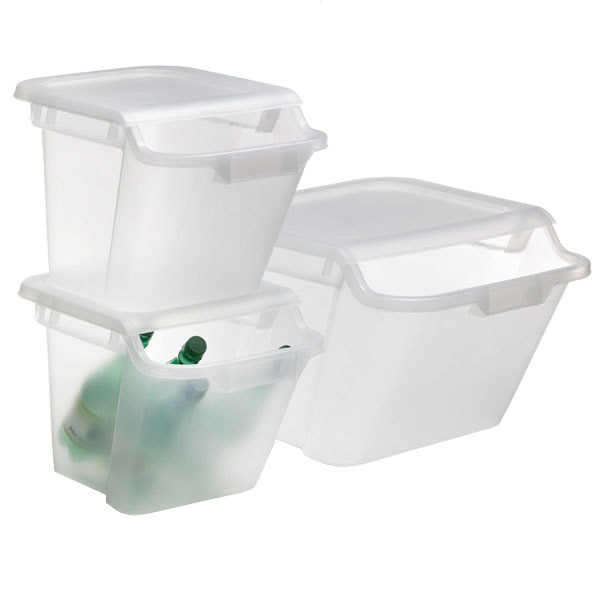 The detachable lids also make it easy to put the bins in your car when you go to the local recycling center. So you recycle your aluminum cans and plastic bottles ... great! But does this mean you live an Earth-friendly lifestyle? What about all those glass jars in your cupboard and in your refrigerator? You know, the ones we just throw away when they are empty. If you do this, I'm not judging you because I threw my glass jars away for years. Never giving it a second thought. If I thought about it, I might take the time to rinse the jar and throw it in the green trash can labeled Recycle. Go ahead, take the next step and reuse those glass jars. The possibilities are truly endless! Not only will you save money buying storage containers, but you will have taken another step toward living an Earth-friendly life. Let your children help too. Once I have rinsed the jars, I let them soak in hot water to remove the labels. Dylan's job is to peel the label off and remove the sticky residue. Kids love this. It's messy and sticky and fun! Plus, this is a great way to learn about reducing waste, reusing what we have, and sustainability. Jelly jar now holds coffee beans and salsa jar holds my baking beans. Baby food jar holds shells from the beach and jam jar holds pennies. I'm talking about those big cups at Disneyland, Sea World, San Diego Zoo, and multiple other places. Sure, they cost more, but also usually come with a reduced price on refills. (around $1) This way you are not throwing away a paper cup, only to buy another one in a few hours when you get thirsty again. We love our big tumblers from the San Diego Zoo! They are perfect for around the pool and we always bring them with us when we go back to the zoo. I pay full price the first time, but then I have $1 refills the rest of the day. I feel good about helping, save money, and the staff really seems to appreciate that I have brought my cup back. This may all sound trivial to you, but the fact remains that every little bit helps. I don't know about you, but I sure don't want the planet my grandchildren live on to be overtaken by landfills and disappearing oceans. Dylan and I recently took the Eco Challenge at Discovery Science Center and learned that we can do so much more with little change to our daily routine. Read the article I wrote for OC Moms and find out how you can take the Eco Challenge and live a more Earth-friendly lifestyle. What other uses can you think of for the jars in your kitchen? You are right, it is a huge problem. I once thought about working on the design for a food store that only uses reusable containers for the things you buy as my bachelor thesis. It would be nice to have something like this.